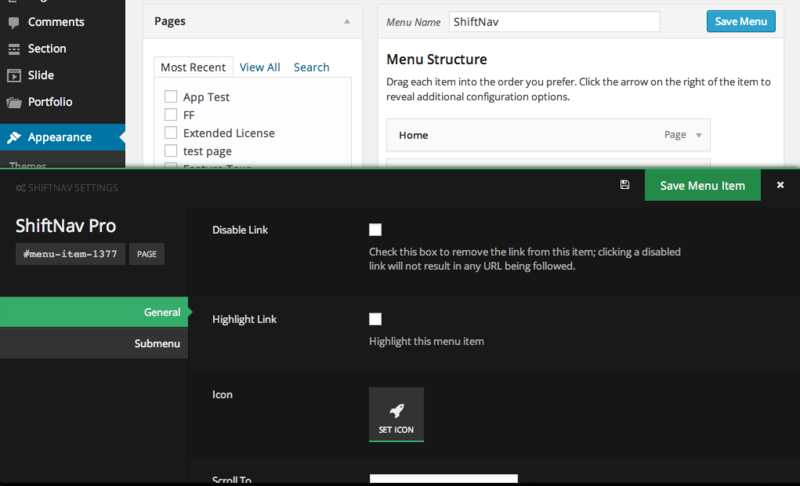 Each Menu Item has configurable ShiftNav-specific settings. To edit the settings, hover over a menu item. A button with the word Shift will appear. On the left, you’ll see the name of the menu item, and below it the menu item’s ID (#menu-item1377) and the menu item type (Page). Below that are tabs that allow you to switch between different panels in the settings. The General tab is open and highlighted by default. On the right, the settings in the current panel are listed. Each setting has a description explaining what it does. In the upper right corner, you’ll see the Save Menu Item button. The ShiftNav Menu Item settings are saved individually for each menu item. 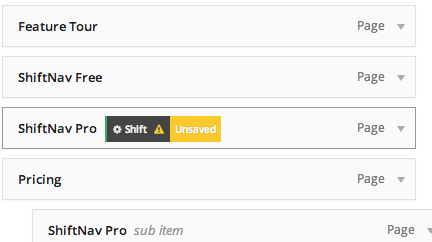 When you make a change in the menu item settings, the icon in the top right will change to alert you to unsaved changes. To close the settings panel, click the × in the upper right corner. To switch to a different menu item settings panel, click the Shift button on that menu item.